I’ll admit it. I had been to Richmond but I had never really “visited” Richmond. Over my many years of living in Virginia, I had traveled through Richmond numerous times, stopped in to visit friends, and toured several attractions. Because it’s so close, just two hours from my home in Northern Virginia, we could get there easily for day trips. When we were invited to visit Richmond, Virginia, for a weekend recently, I looked at the state’s capital through a new lens: the Richmond region has more than enough for a full weekend of family fun and here are just some of the places that make for a nice, kid-friendly getaway. Spending a weekend in Richmond (not just driving through), just to see the city and its surroundings, gave us more than enough to see and do. We were invited by Richmond Region Tourism recently to come spend more time and explore the area, and while we had a busy weekend, we still could have done so much more. Planning on heading there soon yourself with the kids? Here are some of the must-see sights. 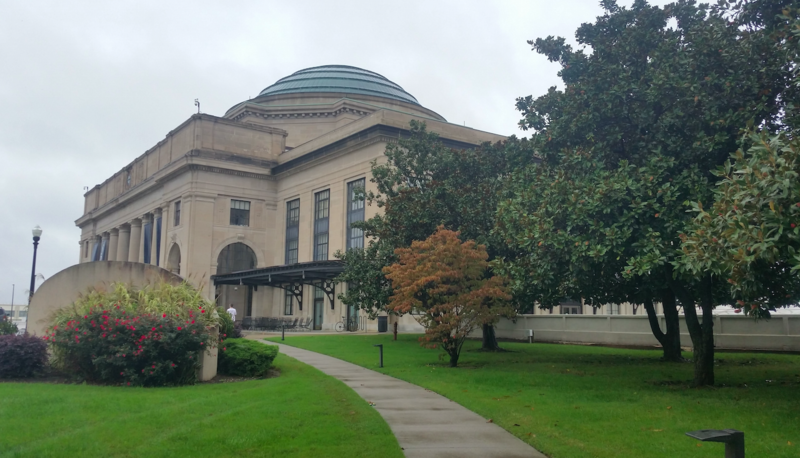 The Science Museum of Virginia (SMV) is one of the first places we ever visited in the area and one we have returned to often. Housed in a former train station, the museum building itself is a magnificent edifice with wonderful architecture. Before you even get inside, though, your kids may make a run for the Earth Kugel just outside the museum. This giant granite replica of the Earth, at a scale of one foot to a thousand miles, is set upon water that makes it easy for visitors to push around. Yes, your kids (and you!) can say that you have moved the Earth! Inside, the museum makes good use of its impressive space with a giant Foucault Pendulum in the atrium. This device, which demonstrates that Earth spins on an axis, look simple but are fascinating to watch: a metal ball or bob suspended from a cable gently swings back and forth, slowly moving location. It’s easy to lose track of time while watching it, so give yourself a few extra minutes to enjoy this. Throughout the museum’s three floors, you will find permanent exhibitions about space, health, electricity, Earth, and more. You’ll find a few animals such as scorpions, snakes and other reptiles and amphibians, and if you time your visit right, you may even get to watch a game of Rat Basketball! Other exhibits focus on health and wellness, power, and other science topics. One exhibit that we found fascinating was Speed, which occupies all the bottom floor just past the ticket counter. Here you will find more than 50 exhibits that are all about how fast – or slow – things move, both on Earth and in space. Also schedule time to see a movie at The Dome theater on the upper level. At 76 feet, this is the largest screen in Virginia! We have enjoyed several entertaining and educational films here and always make time for a film now. The Children’s Museum of Richmond has a clever acronym CMoR (or “see more”) which perfectly describes it. Here your kids certainly can “see more” – plus touch more, explore more, and learn more – as there’s lots to do and it is not just one museum but an attraction now with four locations: downtown Richmond, Short Pump, Chesterfield, and Fredericksburg. In keeping with its clever acronym, the museum’s mascot is Seymour (CMoR) the dinosaur.The museum’s goal is to provide every child with the chance to play, learn, and explore in a stimulating, hands-on environment through activities related to art, science, and culture. The museum opened in 1977 and now is the eighth-most-visited children’s museum in the country. When we have visited CMoR, it’s always been to its downtown Richmond site (CMoR Central), which is very conveniently located right next door to the Science Museum of Virginia, making it super-easy for families to visit both places in one day. CMoR Central is a 44,000-square-foot facility with more than 20 permanent exhibits, including imaginative play areas, a water-play section, an art studio, a dino dig pit, and even a carousel. The pretend-play rooms give your child a chance to be an ambulance driver (or patient! ), deliver the news as a broadcaster, perform farm chores at the dairy barn, prepare food at a Silver Diner, be a teacher, shop at a Wegmans, work at a bank, or repair a car at a service station, for example. There are some other unique areas, such as “The Cave,” where kids can don hard hats and flashlights for an adventure to explore a reproduction of a Virginia limestone cave, and the organic garden that teaches kids about plant anatomy and where food comes from. 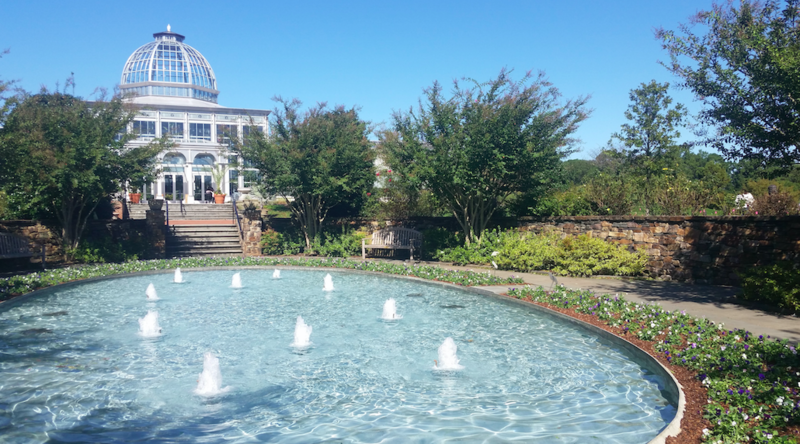 It was only during our last visit that we finally went to the Lewis Ginter Botanical Garden, but I’d like to believe it’s just because we saved one of the best for last. This beautiful attraction, one of Richmond’s most popular, has several distinctive themed gardens, plus a conservatory with indoor displays of tropical plants, orchids, and special exhibits (such as butterflies during our visit). The Ginter is one of the most beautiful gardens I have ever toured, and what is makes this special is the variety of plants and the overall landscaping. Ginter Botanical Garden is open year-round and has more than 50 acres of gardens. Its classical domed Conservatory, the only one of its kind in the mid-Atlantic, houses indoor plants and special exhibits (this is where we saw the butterflies) and is an attraction unto itself. On the grounds, there are more than a dozen themed gardens including the Rose Garden, Cherry Tree Walk, an Edible Display Garden with food-producing plants, an Asian Valley with Japanese and other gardens, and more, including a woodland walk with trails. The Central Garden with its flowers and fountains is lovely (and makes for a nice photo spot). One of the best attractions of the Lewis Ginter Botanical Garden by far is the Children’s Garden. This is a large section with lots for them to do. Here is a “learning landscape” where children can explore and play in a tree house, a greenhouse, and more. The area has sections for water play and international villages, little houses that showcase what life is like in other parts of the world. Special activities include scavenger hunts (since our visit was in the fall, we searched for scarecrows). Be sure to go to the CWDKids Tree House to get a nice view of the overall area. This open-air wooden structure is 13 feet off the ground and provides nice panoramic views of the gardens and the lake. It’s an easy walk with ramps that make it accessible for strollers and wheelchairs, and chirping “birds” that greet you along the way. In winter, the garden hosts the Dominion Energy GardenFest of Lights, one of the region’s most popular events. With more than half-a-million twinkling lights, the garden comes to life at night in a gorgeous display of color and light. History buffs of all ages (or anyone even just looking for an interesting walk) should head to Richmond National Battlefield Park, which commemorates 13 American Civil War sites. Richmond had served as the capital of the Confederate States of America for most of the war so history is rich here, with inside and outside exhibits to explore. A very popular feature is Tredegar Iron Works. As the chief ironworks of the Confederacy, this site supplied much of the artillery the Confederate States Army (possibly about half). Outside, you can still see massive structures that help you envision this heavy-duty equipment back in the day. Inside, the visitors’ center houses a Civil War museum with informative displays. As a National Park Service site, here park rangers can supply your kids with an activity book so they can get a junior ranger badge. We did this and as always, this program was a good way to keep our son learning and engaged. Located in the central Virginia area, Metro Richmond Zoo sits on 70 acres and has more than 2,000 animals to visit. Tigers, giraffes, zebras, rhinos, bison, monkeys, reptiles, birds, and barnyard animals are just some of the animals you can see. Take time to walk through the budgie aviary to see how these friendly little birds will be happy to nibble from your snack sticks (which you can buy for just $1). Be sure to have your camera ready! While visiting the animals could occupy your whole day, you can enjoy other attractions at the zoo including a carousel, a train ride, and a playground. The Sky Lift is a great way to get some rest from walking and enjoy 15 minutes of relaxation as you get an aerial view of the grounds and all its animals. The carousel, train, and Sky Lift are extra charge but carry only nominal fees. For visitors who want to feel like exploring the “jungle” themselves, Metro Richmond Zoo also now operates a ropes course. Treetop Zoofari is a zip line and adventure park that includes a “junior explorer” course for younger guests. Canal Walk – George Washington didn’t sleep here – but he surveyed the area – and these days you can explore with boat tours, walking tours during the day to learn about four centuries of Richmond history through exhibits, art, and historic markers. At night, the Canal Walk provides a nice way to see the city skyline all around you. Kings Dominion – In nearby Doswell, Kings Dominion provides a full day of theme park fun. From rollercoasters and other thrilling rides for adventure seekers to family rides, it’s a great park for all ages. The kids’ section is Planet Snoopy, the largest collection of Peanuts-themed rides and attractions, perfect for young ones. Kings Dominion also has a large and recently renovated water park, a dinosaur park with life-size animatronic dinos, and live shows. …and more! – Other options in the area for family fun include Richmond Raceway, the late-summer Richmond Folk Festival, and water sports such as rafting, tubing, or boarding down the river, or enjoying the thrill of kayaking Class IV rapids nearby. Share the post "Richmond sampler: best kid-friendly attractions"